Lin Anderson is the co-founder of Bloody Scotland - Scotland's International Crime Writing Festival. Now in it's fourth year, Lin talks to us about how it all started. lin anderson is the co-founder of bloody scotland - scotland's international crime writing festival. her latest novel, the special dead, is out now. just to set the scene… around seven years ago alex gray and i went to a cwa conference in lovely lincoln, drank a lot of prosecco and had a wow moment. why were we always coming south for crime festivals? wasn’t it time that folk came to us? and in that moment bloody scotland (alex’s brilliant choice of name) was conceived. it was born in stirling three years later and had its fourth birthday last weekend. and what a bloody brilliant time we had. 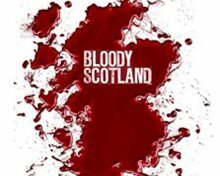 bloody scotland is about selling scottish crime writing to the world, and inviting the world to come visit us. we want to do three things. promote new writers in the genre, offer an opportunity for established writers to extend their audience, and to bring the biggest stars here to scotland. to do this we have a masterclass all day friday, and run three events simultaneously throughout the weekend. in all there were 33 events with 50 authors, plus the never-to-be missed five-a-side football match scotland v england. and before you ask, this year it was a draw 5-5 (we won’t mention last year). from the sold out opening of peter may and val mcdermid in the magnificent albert halls, to the fabulous linwood barclay who took a photograph of the huge cheering audience to prove to his wife that people did in fact come to see him (check it out twitter). his first time in scotland, he’s already planning a return visit, as i hope are many of the other authors who were with us. bloody scotland is known for its quirky programming and this year was no exception. my personal favourites were crime in the spotlight where we presented debut novelists and let them perform a two minute reading before our big events, whose crime is it anyway? with hardeep singh kohli, a panel of three unfortunates (chris brookmyre, kevin wignall and caro ramsay), a wheel of fortune, a football and a copy of katie price’s autobiography. miraculously from these they created a perfect and hilarious murder. crime at the coo where authors performed in the curly coo pub in an improvised ceilidh, featuring everything from an icelandic poem recited by ragnar jonasson, to the twa corbies sung by val mcdermid and the splice girls dance featuring alexandra sokoloff. i had a fabulous event with val on forensics where among other things (and much laughter) we endeavoured to change peoples’ attitudes to maggots. a big thank you to pan macmillan authors for coming north in force to help make bloody scotland the success it was. we look forward to saying ceud mille failte (a hundred thousand welcomes) to even more of you next year.